Choosing the right financial adviser is crucial. In Australia, there are over 26,000 licenced Financial Advisers, and incredibly it is estimated there are only 100 with a business model that eliminates the potential for adviser conflict while ensuring the advice being provided is coming from highly educated and experienced Financial Advisers. The recent Royal Commission into Financial Services laid bare these conflicts. Condemnation of the industry remains scathing, particularly towards the Banks and AMP. The executives and advisers of these institutions are heavily rewarded for “selling” their in-house financial product, and in the eye of the Royal Commission often not in the best interest of their clients. It is embarrassing that both the regulator (ASIC) and the compliance teams within these organisations have allowed these practices to go on for so long. Since the Royal Commission, we have seen a myriad of articles in the financial press along the lines of “Questions to Ask your Financial Adviser.” Below we answer many of these questions, not only to put your mind at ease but to make it clear what distinguishes us from our competitors. This is extremely important. GFM Wealth is 100% owned by our senior staff and directors. We have no institutional or 3rd party owner in our business, and we plan to keep it that way. We (GFM) have long observed that seeking advice from groups with institutional ownership, especially when those institutions also manufacture financial products, poses a significant risk, mainly due to the very significant threat of conflicted advice. 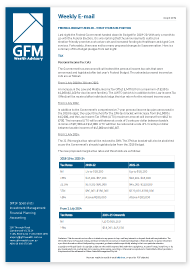 GFM has held its own AFSL licence since 2003, issued by ASIC. The key advantage of being self-licensed is that we are free of any 3rd party influences. Put simply, all decisions on the way we conduct our client relationships are made in-house. Nil. GFM is not a product manufacturer. All investments owned by GFM clients are held directly. GFM is not a custodian and has never held investments on behalf of clients. 4. Which investment platform does your licence provider use? For our SMSF and Investment Management clients, GFM does not use an investment platform. All administration is completed in-house to ensure we are not restricted to only using investments from the menu of that investment platform. We also strongly believe that using an investment platform adds an unnecessary layer of fees which quite frankly, we prefer stays in our clients back pocket rather than paid to some institution. 5. Is your licence independently audited? As a part of its AFSL Licencee obligations, GFM Wealth completes a biennial compliance review which is conducted by an independent 3rd party specialist compliance company. GFM takes its compliance obligations seriously. We have an in-house compliance officer and a deeply embedded culture of respecting our compliance obligations. GFM has never been required to report a breach of advice to ASIC, and in the words of our compliance auditor, GFM is “top shelf” with our compliance procedures and culture. 6. Does your adviser pay referral fees to generate new clients? No. GFM does not pay referral fees and never has. We have many clients that are advocates for our business and refer based on their positive experiences. 7. What are your professional qualifications? GFM Wealth is a Financial Planning Association (FPA) Professional Practice, the highest level of accreditation available to Financial Planning business. It is ludicrous that until recently the minimum level of education required to be a Financial Adviser is a four-subject Diploma. Each of our advisers holds educational qualifications well above the industry standard with a commitment to continuous professional development. As a firm which specialises in SMSF advice, each of GFM’s advisers are also members of the SMSF Association holding specialist accreditations. In addition to being well educated, our advisory team is exceptionally experienced with an average adviser duration of over 12 years. 8. Can you provide me with testimonials of clients in a similar situation? Absolutely. We are always able to provide a list of clients who are willing to advocate for our business and provide potential clients with comfort. Importantly, GFM is no “Johhny come lately”. We have been in continuous operations for 45 years. While it is a simple statement, the key objectives of GFM remain unchanged. It is to provide our loyal clients with comprehensive advice delivered in a professional manner and without conflict. Unfortunately, (or fortunately for us) not many of our peers can preach the same.